Guinness World Records lists Christie as the best-selling novelist of all time. Her novels have sold roughly 2 billion copies, and her estate claims that her works come third in the rankings of the world's most-widely published books, behind only Shakespeare's works and the Bible. According to Index Translationum, she remains the most-translated individual author, having been translated into at least 103 languages. And Then There Were None is Christie's best-selling novel, with 100 million sales to date, making it the world's best-selling mystery ever, and one of the best-selling books of all time. Christie's stage play The Mousetrap holds the world record for longest initial run. It opened at the Ambassadors Theatre in the West End on 25 November 1952, and as of April 2019[update] is still running after more than 27,000 performances. In late 1926, Archie asked Agatha for a divorce. He had fallen in love with Nancy Neele, who had been a friend of Major Belcher, director of the British Empire Mission, on the promotional tour a few years earlier. On 3 December 1926, the Christies quarrelled, and Archie left their house, which they named Styles, in Sunningdale, Berkshire, to spend the weekend with his mistress in Godalming, Surrey. That same evening, around 9:45 pm, Christie disappeared from her home, leaving behind a letter for her secretary saying that she was going to Yorkshire. Her car, a Morris Cowley, later was found at Newlands Corner, perched above a chalk quarry, with an expired driving licence and clothes. Her disappearance caused an outcry from the public. The home secretary, William Joynson-Hicks, pressured police, and a newspaper offered a £100 reward. Over a thousand police officers, 15,000 volunteers, and several aeroplanes scoured the rural landscape. Sir Arthur Conan Doyle even gave a spirit medium one of Christie's gloves to find the missing woman. Dorothy L. Sayers visited the house in Surrey, later using the scenario in her book Unnatural Death. Christie's disappearance was featured on the front page of The New York Times. Despite the extensive manhunt, she was not found for 10 days. On 14 December 1926, she was found at the Swan Hydropathic Hotel (now the Old Swan Hotel[a]) in Harrogate, Yorkshire, registered as Mrs Teresa Neele (the surname of her husband's lover) from Cape Town. On an edition of Desert Island Discs in 2007, Brian Aldiss claimed that Christie had told him that she wrote her books up to the last chapter, then decided who the most unlikely suspect was, after which she would go back and make the necessary changes to "frame" that person. However, John Curran's Agatha Christie: The Secret Notebooks describes different working methods for every book in Christie's bibliography, contradicting the claim by Aldiss. ^ The Harrogate Hydropathic Hotel, now known as the Old Swan Hotel, on the site of an earlier Old Swan Hotel (or as the Swan Hydro) for the location on Swan Road. ^ a b c "1976: Crime writer Agatha Christie dies". 1976. Retrieved 6 August 2018. ^ "Agatha Christie's: The Mousetrap". St. Martin's Theatre. Retrieved 8 March 2015. Here you will find all the information you need about the longest running show, of any kind, in the world. ^ Kastan, David Scott (2006). The Oxford Encyclopedia of British Literature. 1. Oxford University Press. p. 467. ISBN 978-0-19-516921-8. ^ Curran, John. "75 facts about Christie". www.agathachristie.com. Agatha Christie Limited. Retrieved 21 July 2017. ^ Fitzgibbon, Russell H. (1980). The Agatha Christie Companion. Popular Press. p. 18. ^ a b "Has Agatha Christie's most enduring mystery been solved?". The Independent. 14 September 2015. Retrieved 23 November 2015. ^ a b McWhirter, Norris; McWhirter, Ross (1976). Guinness Book of World Records, 11th U.S. Edition. Bantam Books. p. 704. ^ a b Davies, Helen; Dorfman, Marjorie; Fons, Mary; Hawkins, Deborah; Hintz, Martin; Lundgren, Linnea; Priess, David; Robinson, Julia Clark; Seaburn, Paul (14 September 2007). "21 Best-Selling Books of All Time". Editors of Publications International. Archived from the original on 7 April 2009. Retrieved 25 March 2009. ^ The Mousetrap website, the-mousetrap.co.uk; accessed 2 June 2015. ^ Brantley, Ben (26 January 2012). "London Theater Journal: Comfortably Mousetrapped". The New York Times. Retrieved 26 January 2012. ^ "Edgars Database – Search the Edgars Database". theedgars.com. ^ Brown, Jonathan (5 November 2013). "Agatha Christie's The Murder of Roger Ackroyd voted best crime novel ever". The Independent. Retrieved 19 February 2014. The survey, of members of the Crime Writers' Association (CWA) of professional novelists, concluded that Christie's 1926 mystery The Murder of Roger Ackroyd was the finest example of the genre ever penned. ^ Flood, Alison (1 September 2015). "And Then There Were None declared world's favourite Agatha Christie novel". the Guardian. ^ a b c d e f g h i j k l m n o p q r s t u v w x y z aa ab Morgan, Janet P. (1984). Agatha Christie: A Biography. London, UK: HarperCollins. p. 393. ISBN 978-0-00-216330-9. Retrieved 8 March 2015. ^ a b c d e f g Christie Mallowan, Agatha (1990) . Come, Tell Me How You Live. London, UK: Fontana Books. p. 208. ISBN 0-00-637594-4. ^ Thomson, Laura (10 July 2008). Agatha Christie. London. ISBN 0755314883. ^ a b c d e The Mystery of Agatha Christie – A Trip With David Suchet (Directed by Claire Lewins). Testimony films (for ITV). ^ a b c Christie, Agatha (1993) . Agatha Christie: An Autobiography. London, UK: HarperCollins. p. 559. ISBN 978-0-00-635328-7. ^ The House of Dreams: Details, agathachristie.com; accessed 7 August 2015. ^ Hobbs, James. "Archie Christie". Hercule Poirot Central. Last sentence; death only. Retrieved 16 August 2016. ^ Curtis, Fay (24 December 2014). "Desert Island Doc: Agatha Christie's wartime wedding". Bristol Museums, Galleries & Archives. Retrieved 30 December 2014. ^ "First World War > Agatha Christie". British Red Cross. Retrieved 8 March 2015. ^ Jones, Sam (29 July 2011). "Agatha Christie's Surfing Secret Revealed". The Guardian. Retrieved 30 July 2011. ^ "Agatha Christie 'one of Britain's first stand-up surfers'". The Daily Telegraph. 29 July 2011. Retrieved 30 July 2011. ^ a b "Christie's Life: 1925–1928 A Difficult Start". Retrieved 12 February 2017. ^ Hobbs, James. "Agatha's Disappearance". Hercule Poirot Central. Retrieved 21 May 2013. ^ a b c Thorpe, Vanessa (15 October 2006). "Christie's most famous mystery solved at last". The Guardian. London, UK. Retrieved 21 May 2013. ^ "Mrs Christie Found in a Yorkshire Spa". The New York Times. 15 December 1926. Retrieved 16 September 2009. ^ "Agatha Christie's Harrogate mystery". BBC News. 3 December 2009. Retrieved 17 March 2013. ^ "Dissociative Fugue". Psychology Today. 17 March 2012. Retrieved 17 March 2013. ^ "A Brief History" (PDF). Harrogate Borough Council. Archived from the original (PDF) on 15 July 2012. Retrieved 8 March 2015. ^ Axmaker, Sean. "Agatha". Turner Classic Movies. Retrieved 17 June 2017. ^ Cade, Jared. "Jared Cade's Quiz". Retrieved 21 May 2013. ^ "Agatha (Mary Clarissa) Christie". Gale. Gale. Archived from the original on 11 September 2015. Retrieved 22 January 2019. ^ "FreeBMD Entry Info". www.freebmd.org.uk. Retrieved 11 January 2019. ^ a b "Interview with Max Mallowan". www.bbc.co.uk. BBC archives. Retrieved 21 July 2017. ^ John Emsley, "The poison prescribed by Agatha Christie", The Independent, 20 July 1992. ^ Oxfordshire Blue Plaques, oxfordshireblueplaques.org.uk; accessed 21 September 2015. ^ "Sinodun Players". www.sinodunplayers.org.uk. Retrieved 9 February 2018. ^ a b Richard Norton-Taylor (4 February 2013). "Agatha Christie was investigated by MI5 over Bletchley Park mystery". London, UK: The Guardian. Retrieved 29 March 2013. ^ "No. 40669". The London Gazette (Supplement). 30 December 1955. p. 11. ^ "No. 45262". The London Gazette (Supplement). 31 December 1970. p. 7. ^ Devlin, Kate (4 April 2009). "Agatha Christie 'had Alzheimer's disease when she wrote final novels'". The Daily Telegraph. London, UK. Retrieved 28 August 2009. ^ Flood, Alison (3 April 2009). "Study claims Agatha Christie had Alzheimer's". The Guardian. London, UK. Archived from the original on 1 August 2009. Retrieved 28 August 2009. ^ "St. Mary's Church, Cholsey". Retrieved 18 February 2019. ^ a b c d e f Obituary: Rosalind Hicks, telegraph.co.uk, 13 November 2004; accessed 25 January 2015. ^ a b c Acorn Media buys stake in Agatha Christie estate, The Guardian, 29 December 2012. 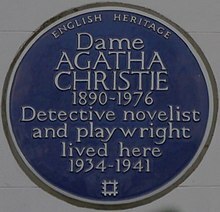 ^ a b c d Agatha Christie begins new chapter after £10m selloff, TheFreeLibrary.com, 4 June 1998. ^ "The Big Question: How big is the Agatha Christie industry, and what explains her enduring appeal?". independent.co.uk. Retrieved 6 March 2015. ^ The Agatha Christie Society. Online. Access 2017-10-22. web site. ^ Agatha Christie: Why we still love her 'cosy crime' novels. The Independent, 2017-9-14. [Online. 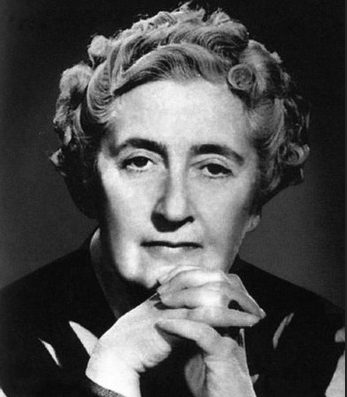 https://www.independent.co.uk/news/long_reads/agatha-christie-cosy-crime-novels-murder-mystery-writer-why-we-love-a7942901.html Online]. ^ Sweney, Mark (29 February 2012). "Acorn Media buys stake in Agatha Christie estate". The Guardian. Retrieved 16 March 2012. ^ "New era for BBC as the new home of Agatha Christie adaptations", radiotimes.com, 28 February 2014; accessed 25 January 2015. ^ "BBC One – Partners in Crime – Episode Guide". Bbc.co.uk. 1 January 1970. Retrieved 16 April 2016. ^ Staff (28 December 2015). "BBC One – And Then There Were None". Bbc.co.uk. Retrieved 16 April 2016. ^ "The Witness for the Prosecution – BBC One". BBC. ^ "Ed Westwick removed from BBC Agatha Christie drama Ordeal By Innocence". BBC News. 5 January 2018. Retrieved 23 January 2018. ^ "BBC One - Ordeal by Innocence". BBC. Retrieved 11 January 2019. ^ "All-star cast announced for new BBC One Agatha Christie thriller The ABC Murders". BBC. 24 May 2018. Retrieved 11 January 2019. ^ "Hercule Poirot Reading List" (PDF). AgathaChristie.com. Agatha Christie Limited. Archived from the original (PDF) on 28 March 2016. Retrieved 19 January 2017. ^ a b Mills, Selina (15 September 2008). "Dusty clues to Christie unearthed". BBC News. Retrieved 9 March 2010. ^ susanvaughan (25 January 2018). "Dame Agatha and Her Orient Express". Maine Crime Writers. Retrieved 20 March 2019. ^ Gross, John (2006). The New Oxford Book of Literary Anecdotes. Oxford University Press. p. 267. ISBN 978-0199543410. ^ "Agatha Christie – Her Detectives & Other Characters". The Christie Mystery. 22 February 2009. Retrieved 25 January 2015. ^ Hobbs, JD (6 August 1975). "Poirot's Obituary". USA: Poirot. Retrieved 30 November 2012. ^ "About Agatha Christie". Artists. MTV. Retrieved 16 September 2014. ^ "The Monogram Murders". Agatha Christie.com. Archived from the original on 3 April 2015. Retrieved 11 April 2015. ^ "An interview with Sophie Hannah". Retrieved 10 January 2018. ^ James, P.D. (2009). Talking About Detective Fiction. Random House. ISBN 0-307-39882-X. Retrieved 31 August 2013. ^ Aldiss, Brian. "BBC Radio 4 –Factual –Desert Island Discs". BBC. Archived from the original on 11 February 2009. Retrieved 22 February 2009. ^ "A Catechism from the Book of Common Prayer, 1549, enlarged, 1637, revised in the Bishop White Book, 1785, now again revised and enlarged" (PDF). Archived from the original (PDF) on 14 October 2008. ^ Hopkins, Lisa. 2016. Who Owns the Wood? Appropriating A Midsummer Night's Dream. In Shakespearean Allusion in Crime Fiction, ed. L. Hopkins, pp. 63–103. Cham, Switzerland: Springer. ^ "The White Knight's Song". Mit.edu. Retrieved 16 April 2016. ^ "Come, Tell Me How You Live, Agatha Christie Mallowan (365 Books, Day 271): rushthatspeaks". Rushthatspeaks.livejournal.com. 28 May 2011. Retrieved 16 April 2016. ^ Wilson, Edmund (20 January 1945). "Who Cares Who Killed Roger Ackroyd?". The New Yorker. ^ Doyle, Martin (15 September 2015). "Agatha Christie: genius or hack? Crime writers pass judgment and pick favourites". The Irish Times. Retrieved 7 December 2015. ^ "About Agatha Christie". Agatha Christie Ltd. Retrieved 7 December 2015. Her books have sold over a billion copies in the English language and a billion in 44 foreign languages. ^ "New faces on Sgt Pepper album cover for artist Peter Blake's 80th birthday". The Guardian. 13 November 2016. ^ "Sir Peter Blake's new Beatles' Sgt Pepper's album cover". BBC. 13 November 2016. ^ Dever 2004, p. 162. ^ a b c "Agatha Christie: Archaeology". Trustees of the British Museum. Retrieved 25 January 2015. ^ "Archaeology is a brand!". Comhem. Archived from the original on 5 May 2012. Retrieved 30 November 2012. ^ Suchet, David (2013). "The Mystery of Agatha Christie with David Suchet". Perspectives. ITV. ^ Larsen, Gaylord. Dorothy and Agatha: A Mystery Novel. Amazon. ISBN 978-0-525-24865-1. Retrieved 30 November 2012. ^ Collins, Max Allan (2004). The London Blitz Murders. Amazon. ISBN 978-0-425-19805-6. Retrieved 30 November 2012. ^ "Musical Agatha". VisitSeoul.com. Seoul Metropolitan Government. Archived from the original on 16 April 2015. Retrieved 10 April 2015. Lubelski, Amy (March – April 2002). "Museums: In the Field with Agatha Christie". Archaeology. Vol. 55 no. 2. Retrieved 28 February 2012.